National soccer boys champions Laiser Hill and regional defending champions Masaka of Uganda suffered defeats in their opening matches at the ongoing East Africa School games in Eldoret. Laiser Hill went down 0-1 against Kenya's Passenga High in an entertaining encounter of Pool B match at Hill School. Passenga netted the score in the 7th minute through a free kick that beat Laiser's keeper Franklin's Otieno who was off his line. Team manager Anthony Kirimi however exuded confidence in the next matches saying his side played a defensive game after the score. "We planned well but I don't know why they resorted to defensive game. We are planning for the next encounter," He said. Defending champions Masaka too were on the receiving end going down 1-2 against their archrivals Alliance of Tanzania. The two teams met in the finals last year in Rwanda and after a 2-2 draw, Masaka won the penalty shoot outs. In other matches Barding of Kenya beat Hanika from Rwanda 2-0. 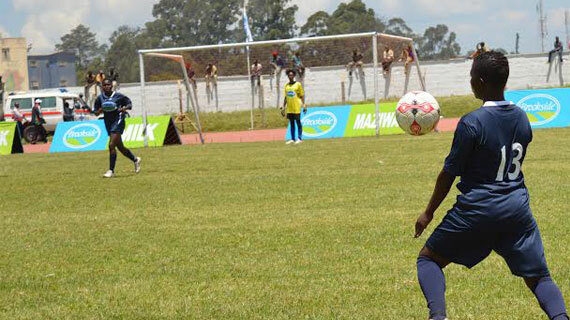 In the girls’ soccer Pool A matches, Nginda of Kenya went down 0-1 against ETG Nyakabiga of Burundi while Uganda's Mukono narrowly beat ES Mutunda of Rwanda 1-0.